One of the greatest parts of the Fall Hershey swap meet are the car corrals. One of the greatest parts of the Fall Hershey swap meet are the car corrals. 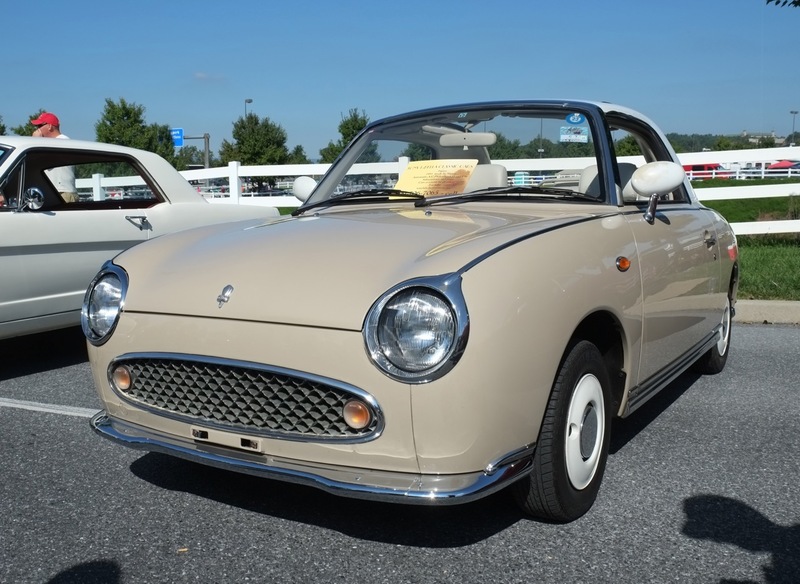 If you are in the market for a classic car, either your first or an addition to your collection, you are bound to find one that fits the bill at the Hershey Swap meet. Also, if you feel that the classic car market has passed you by with ever-rising prices and a lack of affordable options, one visit to the car corrals at the Hersey swap meet dispels that belief. I spent three days going through the swap meet and the car corrals last week and while I am sure that I missed some standout cars that were for sale, I found 10 that I felt were either amazing deals or just really good values for the money. This car was a virtual time capsule, having 65,000 original miles and still in fantastic shape. It was all original except for a respray years ago in the original color that has held up well. The best part was the price of only $6,500 or best offer. I am not sure if it sold but has to believe that at such a low price it did indeed get a new owner. This Mustang notchback in Tahoe Turquoise with a matching white and blue Pony interior was a stunner. Yes it had the somewhat anemic 200 inline 6 but the car was in No. 2 condition with all-original panels, no rust, and not modified in any way. It was also equipped with power steering. The best part was this very nice car, which would make a perfect Saturday afternoon cruiser, was priced at $11,500. I was actually in the car about to make an offer when the car was sold out from under me. This Lapis Grey Nissan Figaro was the first one of these cars I have ever laid eyes on. The car was one of the neatest little cars I have seen come out of Japan. It has an alcantara dash, Italian leather interior and bespoke dash with stunning vintage looking instruments. 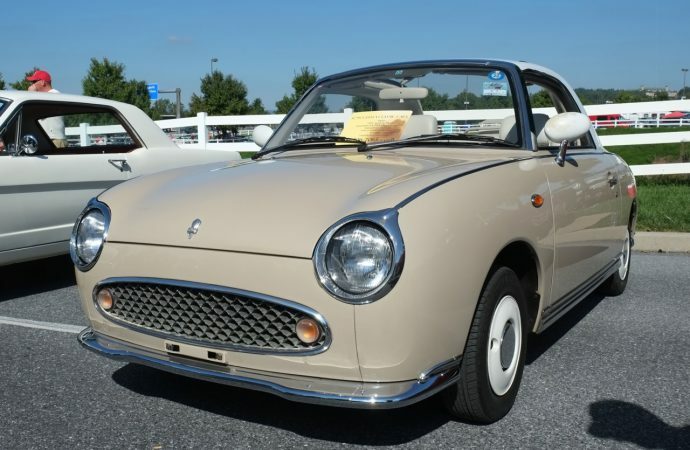 The car was in exceptional condition but sadly the price was high at an asked for $19,500, about double the figure at which Figaro’s tend to trade. Still, it was nice to finally see one up close. This LT1 coupe was largely original and featured a tilt/telescopic steering wheel, automatic transmission, power steering, power brakes and was in very nice survivor condition. The car was all numbers matching and the asking rice was only $27,500. This was by far the best deal of any 'Vette at Hershey. Whoever bought it will have a truly great Corvette. Over the past few years I have grown to love Packards and especially the business coupes. This example was in very nice shape with good paint and a restored interior in correct materials. Yes, the 110 cars are the bottom of the line Packards, but at the end of the day they still have the quality and styling for which Packards are legendary. At the asking price of only $22,000 or best offer you would be hard pressed to find a nicer pre-war Packard in this condition for less money. The NSX has become one of the cars that is seriously moving upward in value and popularity in the classic car market -- and for good reason. These cars are simply awesome. They offer dramatic styling, strong performance and extraordinary build quality. On top of that they are as reliable as any Honda Civic or Accord and they do all of this at what is still a bargain price. This specific car had less than 60K miles and was for sale for only $49,800 or best offer, a very good deal for an NSX. This Mercury wagon was an amazing find. The car has only covered 32,000 miles since it was new and was perfect in every way. It featured the 390 Marauder V8 engine with an automatic transmission and cold factory air conditioning. This was a true survivor car in extraordinary condition. If you are looking for a classic looking 1960s station wagon, this had to be the best one offered by anyone at Hershey. At only $25,5000 or best offer, it truly represented a great buy. This was one of the finest examples of a Bricklin SV-1 I have ever seen. The car had only 7,000 miles and was original in every way, with original gel coat body and interior in perfect survivor condition. The doors had already been covered to an air system and they and everything else in the car worked as it is supposed to. That in itself set this Bricklin above the rest as these cars almost always have non-working systems and a terrible respray. At an asking price of only $18,500 it represented a great car at a very reasonable price. This is the first Dodge Dakota Sport convertible pickup I have seen since they were new and this truck was an amazing example of a failed idea. The concept of a convertible pickup was an answer to a question that no one had asked and very few were sold. That being said, finding something this rare is increasingly difficult. Only 2,842 of these anomalies were built in 1989. The asking price of this rare bird, being all original and having only 75,000 miles from new, was a low $14,500. If that sounds like a lot of money, try finding another. This was a beautiful car, having had a recent full restoration and needing nothing but a new owner. The car featured its original Ford Flathead V8 mated to a 3-speed overdrive gearbox. In had many options including a Continental kit, fender skirts and a push-button radio. You could not begin to restore this car for the money asked for as the paint and chrome work on this car would easily exceed the $28,000 or best offer asking price. These 'shoebox' Ford cars are getting more and more popular and this car represented another great buy.